If it’s a good deal why do people need to be forced to buy it? Do they think we’re stupid? 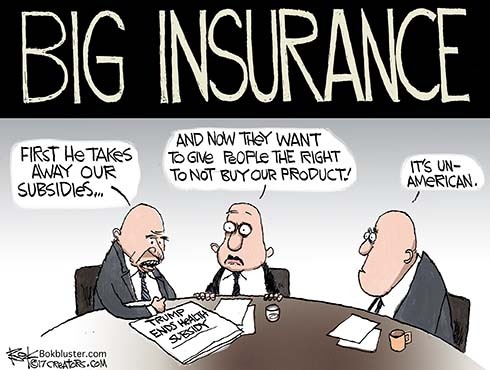 Last week President Trump issued an executive order rolling back President Obama’s executive order to subsidize insurance companies. The subsidies reimburse the companies for reducing certain out-of-pocket expenses to policy holders. The only problem is Congress refused to appropriate money for the subsidies. So Obama whipped out his pen and phone and and started spending the money anyway. And Trump continued that practice. But a federal district court judge says that’s illegal. 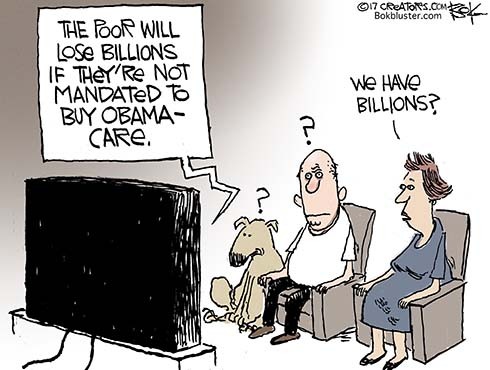 This week two Republican senators, Tom Cotton and Pat Toomey, introduced a bill to to partially end the individual mandate, no longer requiring some people to buy health insurance. Yesterday two more Senators, Republican Lamar Alexander and Democrat Patty Murray, made a deal to keep the subsidies alive. Trump said nice things about it last night but withdrew support today. Time.com tries to explain what’s going here. 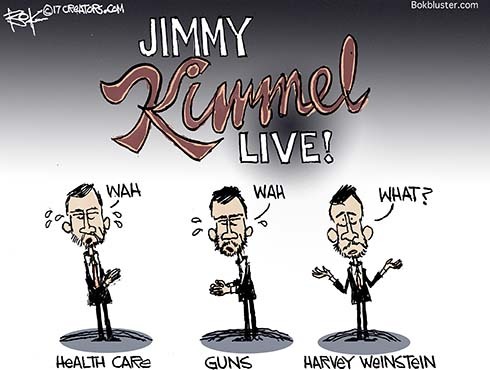 Harvey Weinstein probably won’t have much to say about current events for a while, but Jimmy Kimmel will. The comedian turned policy wonk has had a lot to say about health care and gun control lately thanks to the failed Graham-Cassidy bill and the Las Vegas massacre. As for Harvey Weinstein’s escapades? Well, Jimmy had a lot to say about Donald Trump. Despite the Deplorable decline his ratings are up 11% from a year ago.. Senator McCain sided with Jimmy Kimmel in shooting down best bud Lindsey Graham on Friday. He announced he would vote “no” on the Graham Cassidy health care reform. Those in the know think that pretty much kills the bill. And that would make two health bill kills for McCain. Damn, should have drawn that on the fuselage. Fortune seemed surprised that insurers oppose last ditch Republican efforts to replace and repeal ObamaCare. As usual, the industry’s concern is for consumers. Despite the general view that health insurance companies would benefit from a free and open market, two of the biggest trade groups for insurers — Blue Cross Blue Shield Association and America’s Health Insurance Plans — announced their first opposition to the Republicans’ latest plan to repeal and replace Obamacare. Both the Blue Cross and the AHIP came out against the so-called Graham-Cassidy bill Wednesday, arguing that the legislation would lead to an unstable market that would harm both insurers and patients. The AHIP doubled down on those sentiments, writing that the bill “would have real consequences on consumers and patients by further destabilizing the individual market” and could “potentially allowing government-controlled, single payer health care to grow,” in a letter to Senate majority and minority leaders Mitch McConnell (R-Ky.) and Chuck Schumer (D-N.Y.). 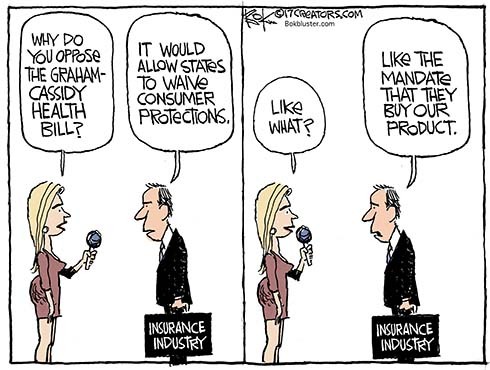 The insurance trade associations’ resistance joins a number of health care groups already speaking out against the proposed bill, including the American Medical Association, the American Hospital Association and the American Association of Retired Persons. The Graham-Cassidy bill, named after two of its drafters, Sens. 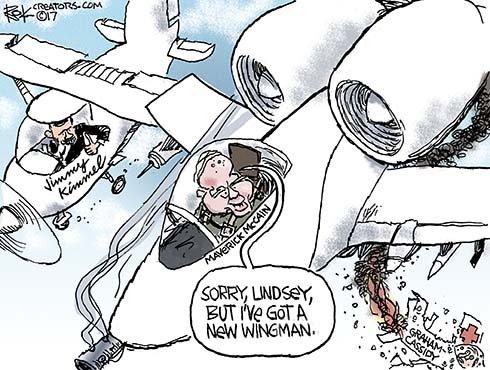 Lindsey Graham (R-S.C.) and Bill Cassidy (R-La. ), has a voting deadline of Sept. 30. The Senate is expected to vote on the legislation next week after several previously unsuccessful attempts earlier this year. President Donald Trump talked up the bill Wednesday, saying that it has “a very good chance” of passing in the Senate.